On February 13, 2018, the official portraits of the 44th President, Barack Obama, and First Lady Michelle Obama were installed in America’s Presidents and Recent Acquisitions, respectively. Mrs. Obama's portrait has been relocated and can now be seen in the 20th Century Americans exhibition on the third floor. Barack Obama made history in 2009 by becoming the first African American president. The former Illinois state senator’s election signaled a feeling of hope for the future even as the U.S. was undergoing its worst financial crisis since the Great Depression. While working to improve the economy, Obama enacted the Affordable Care Act, extending health benefits to millions of previously uninsured Americans. Overseas, he oversaw the drawdown of American troops in the Middle East—a force reduction that was controversially replaced with an expansion of drone and aviation strikes. Though his mission to kill al-Qaeda founder Osama bin Laden was successful, his pledge to close the Guantanamo prison went unrealized. Artist Kehinde Wiley is known for his vibrant, large-scale paintings of African Americans posing as famous figures from the history of Western art. 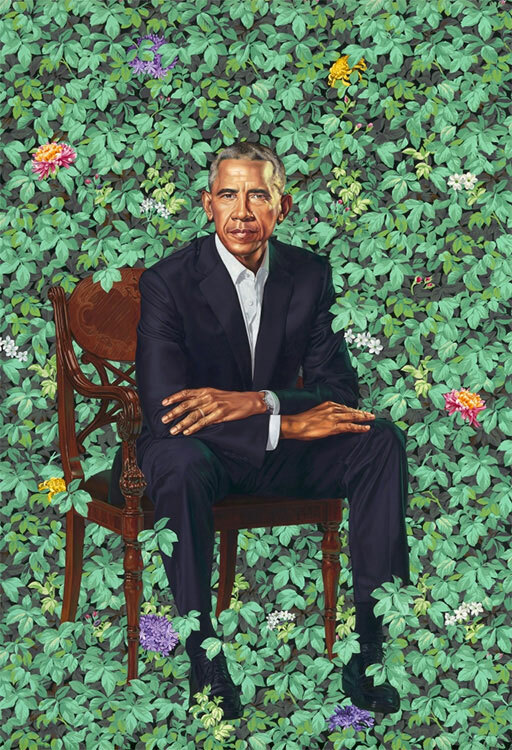 This portrait does not include an underlying art historical reference, but some of the flowers in the background carry special meaning for Obama. The chrysanthe­mums, for example, reference the official flower of Chicago. The jasmine evokes Hawaii, where he spent the majority of his childhood, and the African blue lilies stand in for his late Kenyan father.